Variety is the spice of life, not just for us humans, but for our four-legged family members as well. Neighborhood walks and dog park visits are fine, but for his overall well being and quality of life, your canine companion should be offered a wide range of games and activities that challenge his mental and physical abilities. Rather than the same old boring daily walk with your dog, why not incorporate a few of these simple, fun activities into your routine? You can do several of them indoors, so winter weather is no excuse! Hide and seek. A game of hide and seek doesn’t have to be limited to the two-legged kids in your family, as many dogs enjoy playing, too. Hide and seek challenges your pet’s obedience skills and provides both mental and scent stimulation. ‘Here’s how to do it: grab a few treats, and give your pet a sit-stay command. Go into another room to hide, and once you’ve tucked yourself out of sight, call your dog. When he finds you, reward him with praise and treats. Step aerobics. If your dog is fully-grown (her joints are fully developed) and you have stairs in your home, this game is a good way to get her heart pumping. Go to the bottom of the stairs and put your dog in a sit-stay. Throw a toy up to the landing, then give your dog the nod to go after it, ascending the steps as fast as her legs will carry her. Allow her to come back down the stairs at a slower pace, to reduce the risk of injury. Ten or so repetitions of this will get your dog’s heart rate up and tire her out. I use stair exercise, in conjunction with Dr. Sophia Yin’s awesome Treat&Trainsystem all winter at my house. 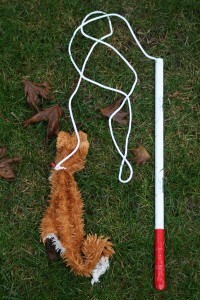 Flirt sticks appeal to the prey drive in dogs, and they’re a fun way to exercise your pet in your backyard (or in the house if you have the space or your dog is small) without overly exerting yourself. The game is simple -- you drag the toy on the ground in a circle, and your dog chases and tugs at it.